This original design hand painted wooden plate is unique to Manchester Cottage. 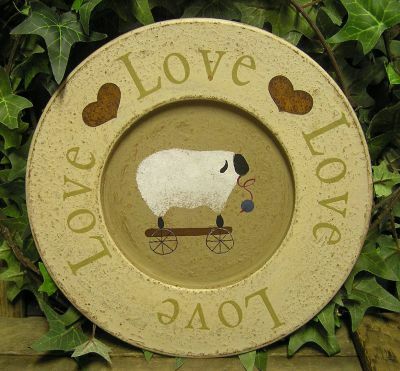 It features a sheep in the center and says "Love" around the outside and has two rusty tin hearts in between the words. It measures 8 x 8 x 3/4. The scene on this wooden plate shows an evergreen tree with cardinals. There are stars in the sky and snow on the ground and a little sheep under the tree. 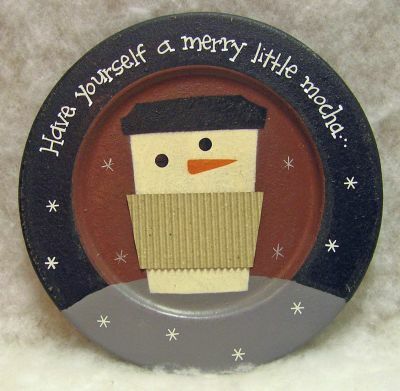 It can be personalized in the snowy area on the bottom. It measures 12 x 12 x 1. 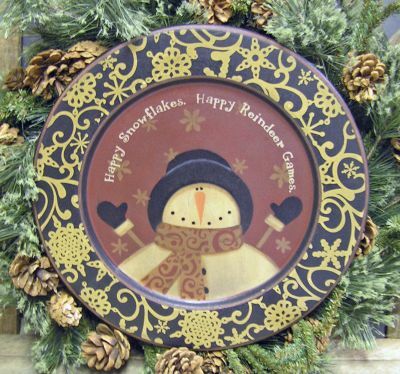 "Happy Snowflakes. Happy Reindeer Games." is printed on this plate over a cute snowman. It measures 11 x 1. This original hand painted plate is unique to Manchester Cottage. It features three wooden snowman heads with bows and bells and says "Friends warm even the coldest days". It has white flyspecking and can be personalized. It measures 12 x 1. 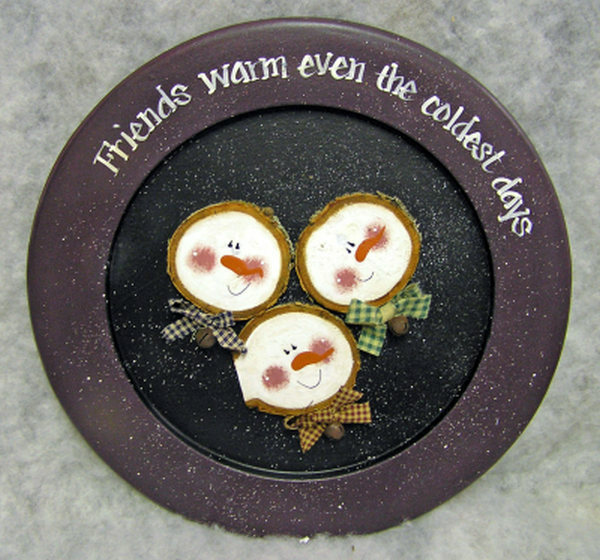 This is an original design wooden plate from Manchester Cottage featuring hand painted wooden snowmen heads with fabric bows. It says "Friends warm the coldest days" around the outside and is white flyspecked. This measures 6 x 6 x 1. This original designed hand painted plate is unique to Manchester Cottage. 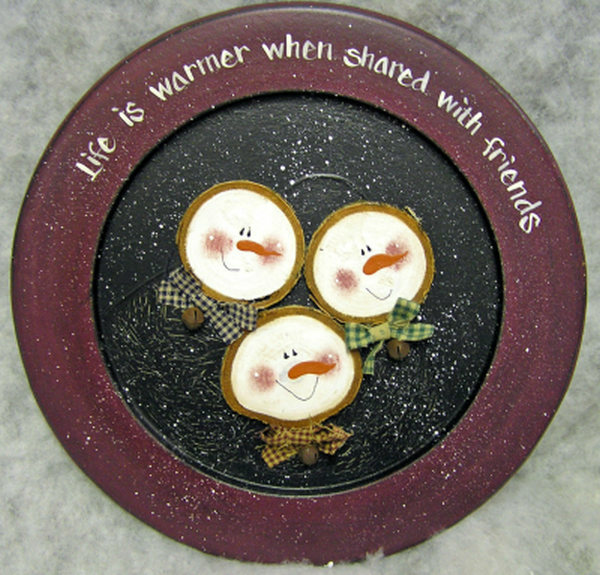 It features three wooden snowman head with bows and bells and says "Life is warmer when shared with friends". It is white fly specked and can be personalized. 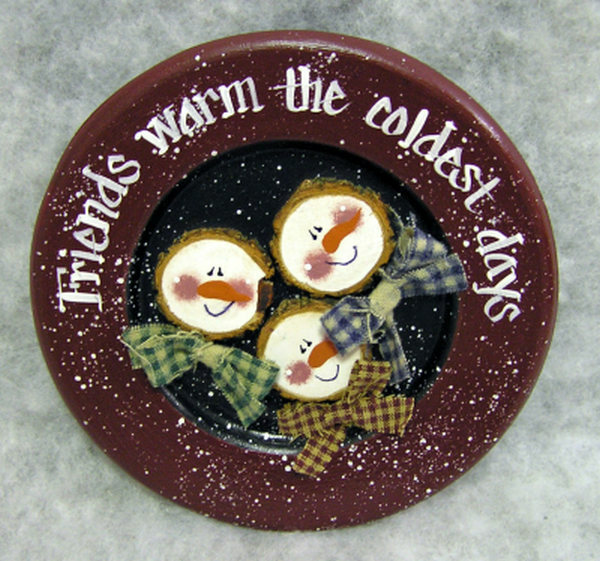 This is another original design hand painted plate that is unique to Manchester Cottage. It features a snowman wearing a snow hat and hanging out with his cardinal friends. 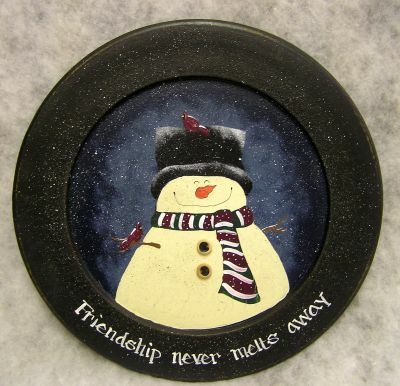 There are two rusty tin stars at his neck, white flyspecked snow, and says "Friendship never melts away" at the bottom. 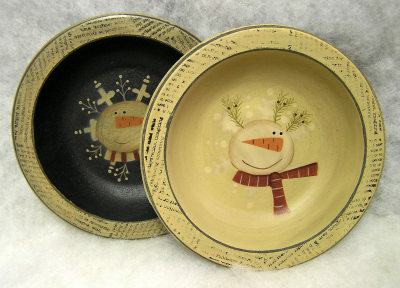 These wooden snowman plates come in two colors: cream and black. 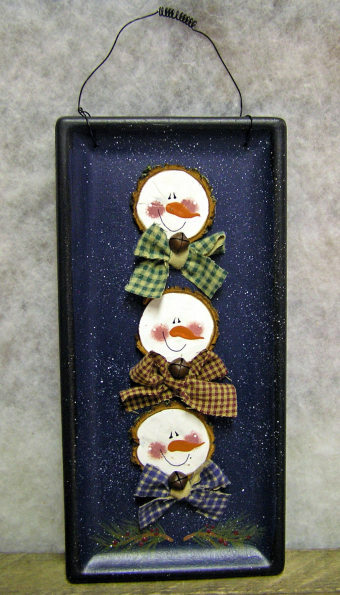 They feature a snowman head, scarf, and snowflakes painted in the center. They measure 6 x 6 x 1. This wooden tray is a Manchester Cottage original design. 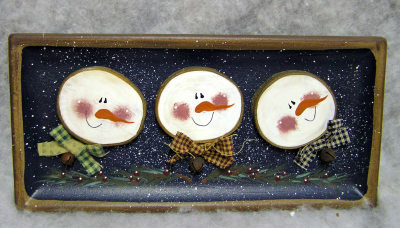 It features 3 wooden slice snowman heads with bows and bells on them. Greens and berries are hand painted across the bottom and it is white fly specked. 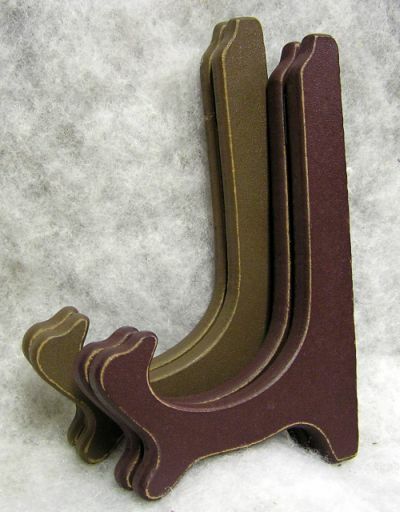 It comes in sitting tray (shown) and hanging tray with wire hanger (click on photo to see this option). It measures 5 x 11 x 1. These are our hinged wooden plate stands. 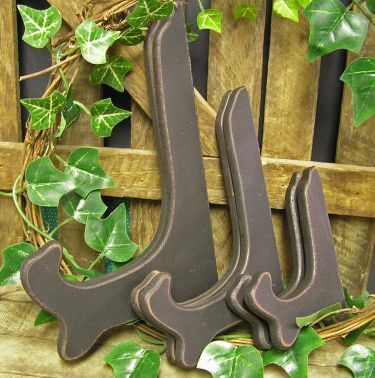 They come in 3 sizes: Large 9" (holds most plates larger then 11"), Medium 7" (holds most plates between 8" and 11"), and Small 4 1/2" (holds most plates smaller than 8").